The following is a guest post by Jennifer Calonia. Having candid conversations with your partner about debt can feel uncomfortable, especially if you’re newlyweds or planning a marriage and future together. The reality, however, is that money is often the leading cause of anxiety and stress in a marriage. According to a 2018 study by Ramsey Solutions, a financial education resource, 86 percent of couples who got married in the last five years started out in debt. What’s more troubling is that couples with higher amounts of debt reported arguing more about money than respondents with less debt. To avoid years of stress and heartache, have hard discussions early. Ask questions about each other’s debts and agree on a repayment strategy before you tie the knot. Communication can help turn a stressful situation into a marriage based on honesty and teamwork. If you and your spouse want to combine your debts, here are a few key areas to explore. Before filling out consolidation paperwork or making permanent debt-related changes, start by assessing each other’s financial health. Ask these core questions as you open the floor for conversations about debt. Keep in mind that your credit scores and credit reports don’t magically combine once you’re married. These talking points foster transparency in your marriage about past and current debt. For example, a credit report covers active and closed lines of credit, recent inquiries, bankruptcies, and overdue debt. Sharing these details will help you both learn about recurring financial habits that might be problematic when working toward your long-term goals, like buying a home. You and your spouse are also entitled to receive a free copy of your credit report every 12 months. While your spouse’s poor credit history may not be a cause to end your union, surfacing credit concerns can help you both strategize a debt repayment plan together. 2. What’s our total debt? In addition to reviewing each other’s credit reports and scores, you’ll want to calculate the hard numbers you’re up against – whether you’re planning to combine debt through formal debt consolidation or refinancing, or just want to figure out a plan for lowering your overall household debt. Combine the remaining balances for each account and add up monthly payments, including the interest rates, so you have the full picture. Tally your total monthly expenses so you and your partner know how much of the household income is available to double-down on repaying debt, and how much is locked up for recurring expenditures. 4. What are our long-term goals? Knowing where you and your sweetheart stand on long-term goals is critical to mapping out a debt repayment plan that works toward those goals. This conversation will likely lead to more questions, but that’s okay. You may not be able to figure this one out in one sitting, but starting the conversation early helps guide decisions about your debt, like setting a deadline for being a debt-free couple. 5. Do we live in a community property state? It’s helpful to know how you factor into your spouse’s debt liability on a legal level. In general, unless you cosign on your spouse’s debt (before or after getting married) or open a joint account after marrying, you’re not liable for their debt in the event of divorce or death. 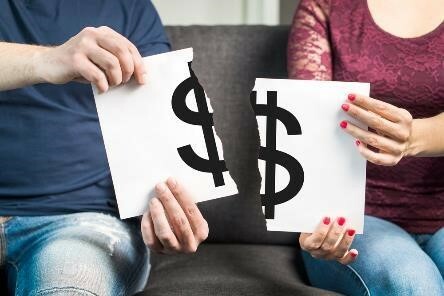 In these states, both spouses are equally responsible for any debt that accrued during the marriage (e.g., credit card debt or a car loan that your spouse took out without your consent) so setting ground rules about large purchases should be an important part of your debt reduction plan. The only exception to this rule is in the state of California, where educational loans are considered separate and not community property. As newlyweds, there are many ways to lower your debt together, so think creatively and come up with a plan that works best for your shared future and goals. Debt avalanche. This approach saves you more money on interest over the life of each loan. For this strategy, you’d pay the minimum on every account, but apply extra funds toward the debt with the highest interest rate. Once you’ve repaid the account in full, move on to the next highest interest rate account, and so on. Debt snowball. This method is all about small wins to keep you motivated about paying off your debt. First, make the minimum payment on all your debts, but apply extra funds toward the account with the lowest balance After you successfully pay off one account, move on to the next highest balance, and so on. Debt consolidation or refinancing. Another option to repay debt is through debt consolidation programs or refinancing, which combine multiple debts into one new loan. This approach requires a good credit score, but it may also carry a higher interest rate or longer repayment term (both of which might mean more cost in the long run). You’ll both need consistency and communication to stick to your debt repayment plan. Whichever method you and your partner decide on, you should both acknowledge that you’re in it together. And don’t forget to celebrate the wins – no matter how big or small – along the way. The boxes are unpacked, but there’s still a lot to be done -- like, personalize your space. We’ve rounded up the top to-dos in order to make your home yours. 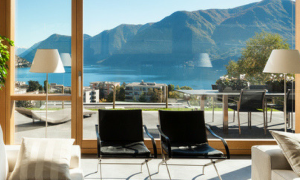 Eight questions to ask yourself as you make a decision on a vacation home.